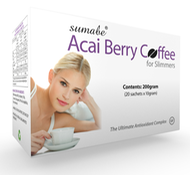 Created from the highest quality organic coffee beans, teamed with the antioxidant rich Acai Berry, the carefully selected ingredients in Sumabe® Acai Berry Coffee have nutritional benefits to assist in healthy weight management and overall well being in conjunction with a healthy diet and regular exercise. Sumabe® Acai Berry Coffee is an instant style coffee that can be adapted to your current routine. Simply replace your morning coffee with Acai Berry Coffee, it’s that simple! DIRECTIONS FOR USE Once per day. Dissolve 1 sachet in a cup with 200mL of boiling water 15 minutes before breakfast. May add low fat milk or sweetener to taste. Stir well. Enjoy! Coffee Arabica (45%), Acia Berry (10%), Cinnamon, Fenugreek, Griffonia Simplicifolia, Citrus Aurantium.